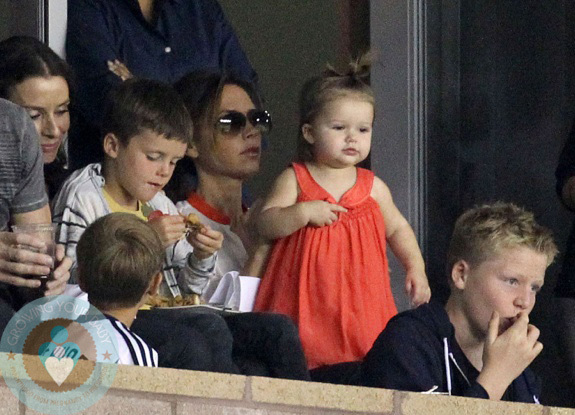 Home » Victoria Beckham & Her Kids Cheer David On In LA! It was a family affair at the LA Galaxy game on Sunday. Fresh off a trip to New York City Victoria Beckham and daughter Harper joined her boys Brooklyn, Romeo and Cruz to cheer dad David Beckham on for the regular-season finale against Seattle. Victoria sat with Harper on her lap lifting the toddler up to cheer for her dad. She also showed off her hairdressing skills by working her tiny princesses hair into a fountain on the top of her head. The boys munched on snacks in between cheers and socializing. The family was joined in their private box by Gordon Ramsay and his son Jack. Also in attendance was Giada de Laurentiis and her daughter Jade. The support was enough to give the LA Galaxy their last win of the regular season. Now the team needs another win on Thursday to ensure a spot in the playoffs. My guess is that we’ll see the whole crew out again for that game!